Fly Casino is pleased to present Torrente online slot. Based on the Spanish movie series from 1998-2011, this movie themed slot celebrates the fun charterers of this series with images and video clips. You don’t really need to know anything about the film or the characters to enjoy this video slot here at Fly Casino! 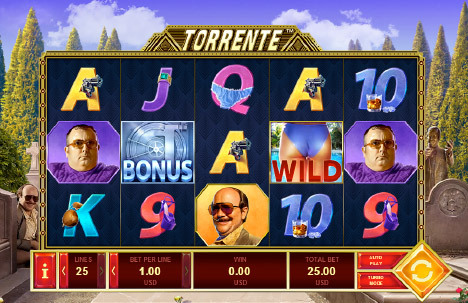 Torrente is a 5-reel, 25-payline game that casino comes with two bonus features. Hotel Paradise Free Games feature -get the wild symbol on reels 2, 3 and 4 on the same spin and you’ll receive 15 free spins. All wins are paid with a 3X multiplier. The feature can be re-triggered. Óperacion Eurovegas Bonus feature – This is a fun 2-stage you-pick-it bonus that is triggered by getting 3, 4 or 5 scatters on the same spin. The first stage will offer you a spin wheel. A cash prize is awarded depending on the outcome of your wheel spin. The second stage of winnings occurs when you are taken to a bank vault where you’ll be given the choice to pick stacks of cash. You pick until you hit a collect. 120% Up to $240.00! From 00:00GMT until 23:59 GMT, all members on their deposit of $/£/€30 or more will receive a 120% bonus up to $/£/€240.00. 166% BIG TUESDAY! From 00:00GMT until 23:59 GMT, all members on their deposit of $/£/€50 or more will receive a 166% bonus up to $166.00 bonus.